Let’s get this out of the way first: Christoph Laimer’s 3D-printed watch (with tourbillon) is large, fairly inaccurate, and only runs for about 30 minutes. But it’s one small step for Swiss watchmakers hoping to make their masterful creations more affordable, and one giant leap for the 3D-printing industry. A few years ago Swatch came up with a new manufacturing process for its Sistem51 line that made a watch with a genuine Swiss mechanical movement available to anyone with an extra hundred dollars to spare. And now Christoph Laimer, a Swiss engineer himself, brings us one step closer to a mechanical watch that anyone with access to a 3D printer can make themselves. 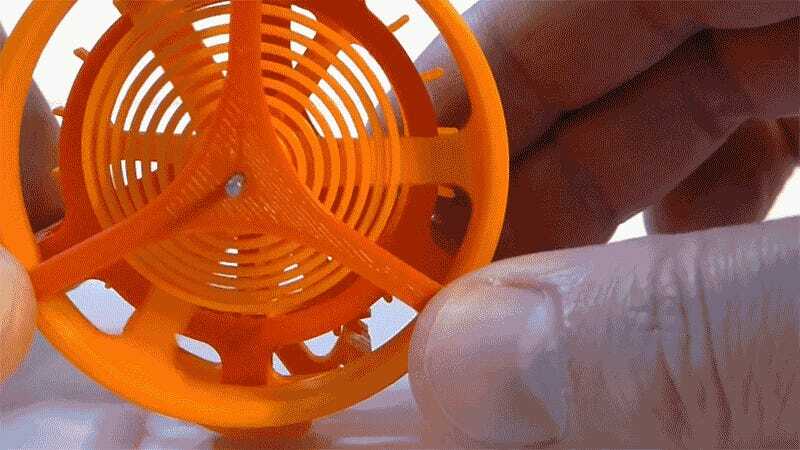 Every last part, save for a few metal pins holding it all together, are made from 3D-printed plastic. Even the flexible spring came from a 3D printer, which is why this watch isn’t especially accurate. But since there are 3D printers capable of creating parts from actual metal, there’s no reason this timepieces’s accuracy can’t be greatly improved. Laimer has provided the source files for his watch over on Autodesk’s 3D printing hub, and anyone can download them—for free. Even if you don’t have access to a 3D printer, exploring the various components that go into a genuine mechanical watch (no quartz crystals here) through the 3D models is fascinating. You’re also welcome to take a shot at improving Laimer’s watch design, but based on Hodinkee’s interview with the Swiss engineer, and watching this breakdown he made of how his 3D-printed watch is assembled, it seems like he has an above-average mastery of the craft—so good luck with that.